Anyhow. Conceptually justified to the max, I took out the above-depicted half bottle of Kuentz-Bas. And rather fine it was, too: poised and sharp, cialis online to buy fruited and taut. Its colour was pale, russet-tinged. Once it’d been out in the glass a while, it really bloomed and softened. Relaxed. Supple and smooth, with a tiny gruff stemminess at the back of it. Beautiful to hold in your gob. Light, effervescent. It is an absolute avalanche of joy to be able to buy a wine like this in a half bottle. Thank you, once again, Wine Society; thank you. And thank you, Pinot Noir Day. Or whatever your name was. 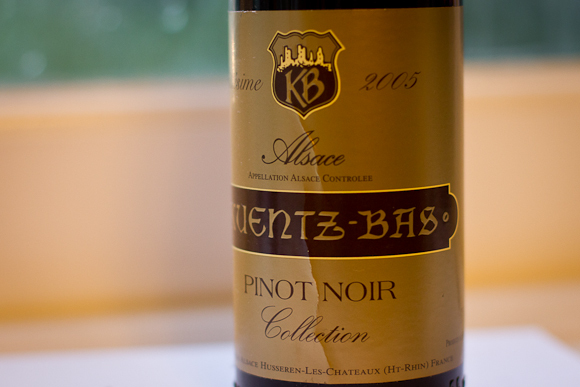 Interesting that you selected an Alsace PN – never really discovered one I thought was worth bothering with myself. Have always wondered why they bother with it at all to be frank. Watch out for “World Grenache Day” later this month, Old Parn.